The SafetyProE network ethernet labeler makes label printing in a shared environment easy! Simply setup and connect the SafetyProE to your ethernet network and install the drivers and software on as many host PC's as you wish. With exceptional print resolution, full-resin thermal transfer processing and durable vinyl labeling tape, the SafetyPro delivers quality labels from any PC on your network. Save time AND money by sharing the SafetyProE between workstations. Stand-alone, the SafetyProE doesn't require a host PC. 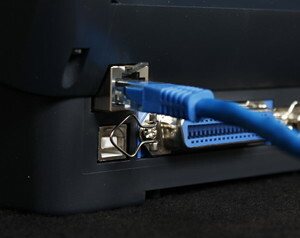 It connects direct to your wired network for instant, hassle-free sharing. Don't get stuck with proprietary safety labeling equipment and supplies! 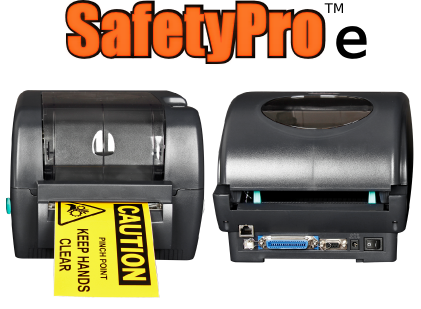 SafetyPro supplies are fully compatible with a variety of vinyl label printers, and are chemically identical to supplies that cost almost twice as much from other suppliers. You get more vinyl for your budget dollar; we're serious about saving you money! People choose SafetyProE for its quality, speed, durability and support. You won't find an industrial label printer out there that matches the SafetyProE, and you won't find a company out there that matches ISS on customer service! People also choose SafetyProE for its ease-of-use! Don't buy a printer that looks good, but has lousy software and support! With SafetyProE, you get a site license to a full labeling suite, FacilityWare, complete with over 2500 safety and labeling icons, plus over 4500 blank and pre-made sign templates. Call 877-762-9280 today and we'll answer all of your questions about the SafetyProE network label printer, or about your labeling project requirements. Ask us how you can save more with package and volume discounts too! * Available only with ribbon and tape orders, please make sure to add the proper supplies to your order.